Post number two in my anti-shopping Christmas extravaganza. This one’s a syrup that can be used just as easily in a cup of coffee as a Christmas-themed martini. What is Christmas about anyway, besides the religious aspects? Isn’t memories what we’re really trying to wrap in paper and bows for Christmas? That’s what we really are trying to box up and gift. For example, just think of late mornings in winter, sitting in the warmth of your kitchen or local coffee shop looking out over a snowy street, sipping flavoured coffee and talking with a special friend. You remember that for far longer than what Aunt Martha gave you two years ago. Those coffees set you back a pretty penny. But flavoured syrups are unbelievably easy to make at home. They also are inexpensive, and impressive, gifts. 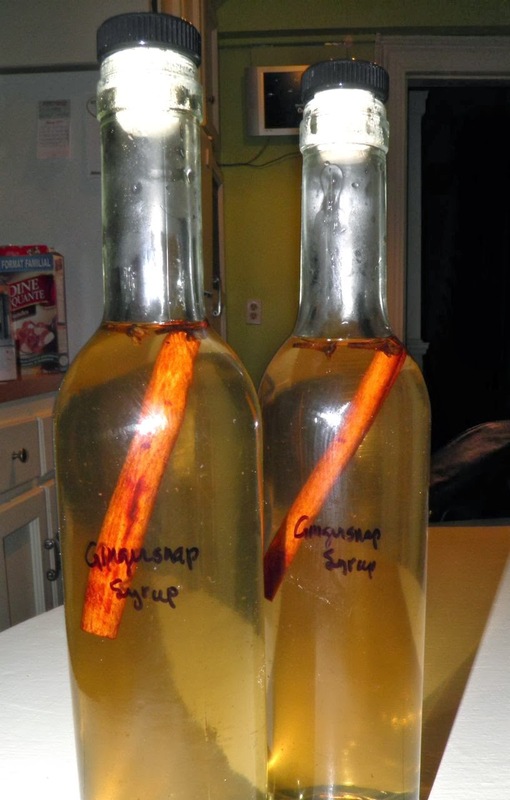 If you want to give memories, you should think seriously about making a few syrups this Christmas. Ingredients for homemade syrups are easily obtainable, depending on what you want to make, and you can have them boiled and bottled in no time at all. Chocolate, vanilla, raspberry, peppermint… they’re all a breeze. 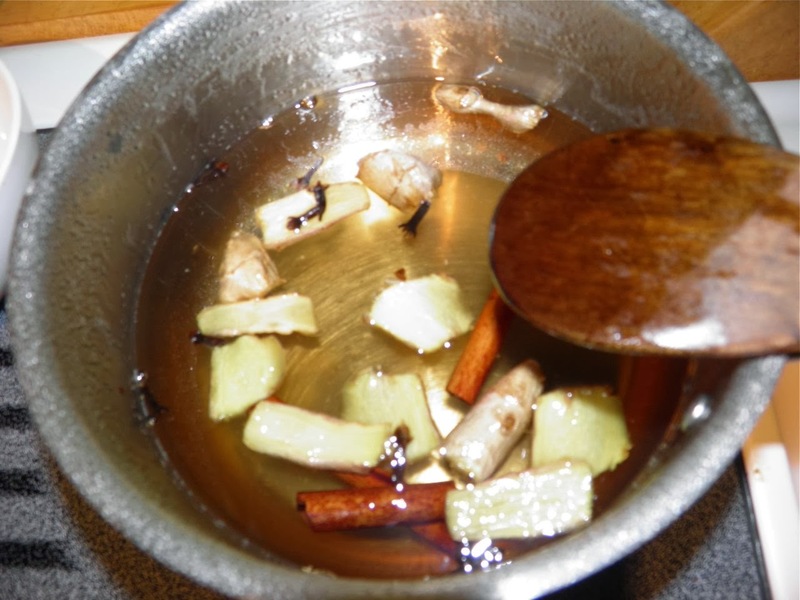 If you can put sugar and water in a pot you can make gourmet syrups. After boiling. Just slightly brown. For example, to make peppermint syrup just boil equal parts water and sugar as outlined below and then add as many drops of peppermint extract (or melt candy canes in it as it boils!) as you like. Unbelievably easy. This one tastes like gingerbread. 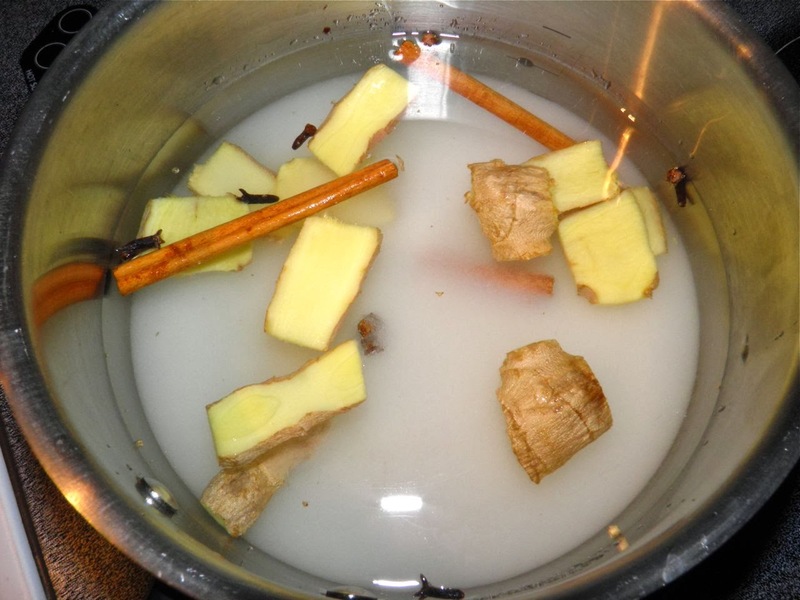 The flavours are ginger, cinnamon stick and clove – just like the cookies and cake. The only real expense to make these as gifts are the bottles. I used my usual 375 ml liqueur bottles with cork stoppers, at about $1/bottle. Tie with a bow and you're done. Don’t be stingy with your container sizes. Each cup of coffee needs about one to two tablespoons to flavour properly. It’s such a nice and useful present to receive it’s sure to go quickly. Maybe write the recipe on a card so recipients can make more of their own! The recipe below yields two bottles, but feel free to increase it if you wish. It’s the temperature that’s important to turn the sugar and water into a beautiful, thick syrup. If you're doubling or tripling this recipe you need to use a candy thermometer to make sure the correct temperature is reached. Combine all the ingredients in a pot. Bring to a boil and let cook for 20 minutes. The temperature should be between 215°F to 220°F for "thread" stage. 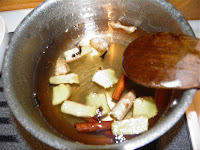 After temperature has been reached, strain the solids from the syrup, stir in the vanilla and bottle. 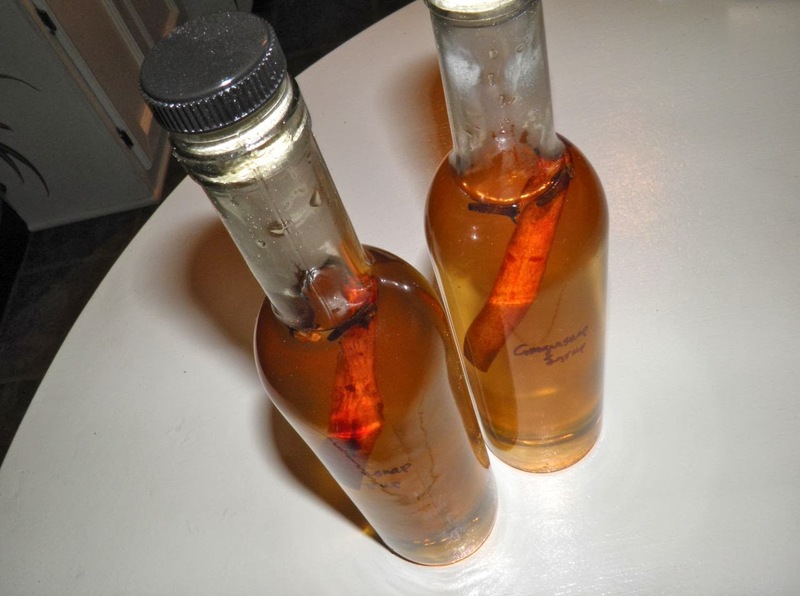 Place a piece of the cinnamon stick and a few of the cloves from the pot in each bottle. This will deepen the spiciness of the syrup over time. Refrigerate until ready to use. This will keep for at least 1 month. Feel free to comment. They’re always appreciated. I’ll answer quickly and as best I can. Feel free to share this post. All I ask is if you repost, please give me credit and a link back to the original on this site. Goodbye 2013. Sweet, yet sour.